I already posted this on PhotoRumors, but since I am still getting emails about it, I have to mention it again. The Japanese magazine CAPA published their annual "predictions" on upcoming cameras from Pentax, Sony, Canon and Nikon. 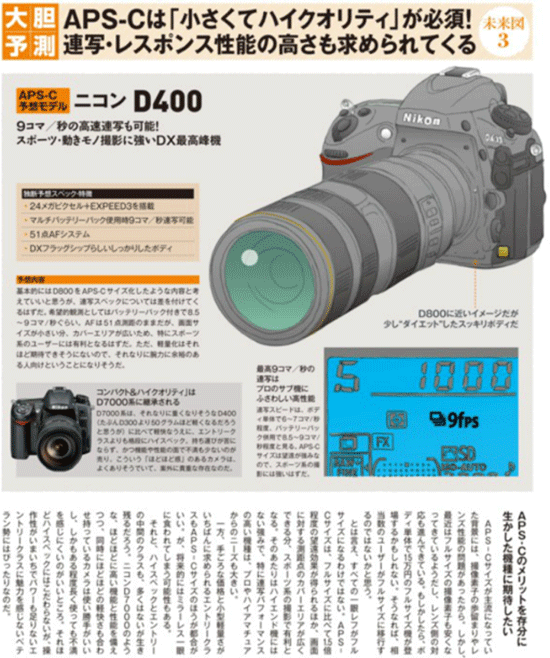 On a full page they describe the D400 as being a 24MP APS-C camera with 9fps and 51 AF points. Again, this is not a leak or any type of reliable source, just the opinion of the editors. You can check their track record from their previous articles on the Nikon D4 and D900, a 24MP D700x camera and this Nikon D95 (their Sony and Pentax predictions were also not very accurate). As far as I am concerned, Nikon may completely eliminate the high end DX line (D300s) and replace it with a lower end FX camera (D600). They may also further upgrade the D7000 replacement to become the top of the line DX camera. Just like CAPA magazine, this is not a reliable information, just my opinion. The D5100, D7000 and D300s are all due for replacement this year and I cannot see Nikon releasing three new DX models after the D4 and D800/D800E (and the rumored D600). Something has to go and I think it will be the D300s line. This entry was posted in Nikon D400 and tagged CAPA magazine, Japanese photo magazine. Bookmark the permalink. Trackbacks are closed, but you can post a comment.